Sony has announced it has managed to create the world's first touchscreen e-reader which doesn't impede the quality of the e-ink screen - the next-generation of the Sony Reader Touch. When TechRadar caught up with Amazon at the launch of the Kindle, Steve Kessel, senior vice president for Kindle at Amazon was vehement that it would never make a touchscreen device as it would impinge on readability. Kessel noted: "If you put touch on an e-ink display – a reflective display – then anything you put on the top ruins readability. You can already see this with some devices which are out on the market at the moment that have integrated touch into the displays." Sony knows this and this is why it has managed to create a touchscreen display for the Sony Reader Touch which does away with the extra layer and with it the reflectiveness of the display. "You usually have to put a film over the e-ink display to make it touchscreen but we have created the only device this year which is finger controlled and with no extra layer," explained Sony Reader marketing manager Omar Gurnah. 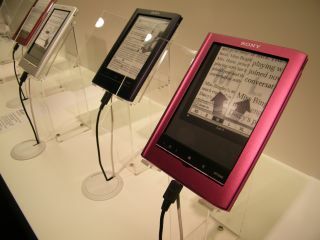 The Sony Reader Touch does come equipped with a stylus but the new optical screen technology, called E Ink Pearl, can be used with fingers as well. The new tech also means improved contrast with 16 levels of greyscale. Waterstones has the Sony Pocket Edition priced at £159.99 and the Sony Touch retailing for £199.99. Both of these are currently on pre-order with the UK release date for both the Touch and Pocket set for 17 September. It will be interesting to see if the next iteration of the Amazon Kindle in the UK will indeed adopt the technology Sony is using or if it will speak to its non-touchscreen word.